Dare #4: By email or telephone, if possible ask your spouse the question, “How are you doing? Is there anything I can do for you?” As we think loving thoughts we are spurred on to loving actions. When I first read the chapter for Day 4 in The Love Dare I thought I've got this covered. I’m always thinking of my husband and I tell him frequently how much I love him and miss him. Almost every conversation begins with the question, “How are you doing?” I ask him often if he needs anything. Dare completed. Check! God had a different opinion and kept me right where He wanted me . . . on Dare #4. I needed to be more intentional with my thoughtfulness. On a recent phone conversation with my husband I did not simply ask him how he was doing. I went deeper. For the first time I asked him to share with me how he felt about his deployment. I know being away from home is hard on him too. I’m not the service member but I assume they want to feel as though their mission serves a purpose. Did he feel good about why he was there? And then . . . I listened and learned from him. Taking the time to ask my husband questions and then listening to him helps me to better understand the world he currently lives in (on the other end of the world) and the needs he may have so I can act on those needs. It’s a thoughtful expression of how much he matters to me. 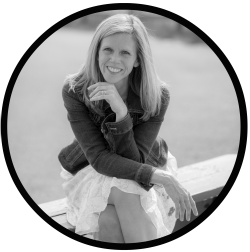 Intentionally listening to my husband reminded me of why I started this love dare series. I had been slow to listen to him but quick to speak, and quick to get angry. I let my own desires get in the way of showing love to my husband. Thoughtfulness requires us to talk less and listen more. When we do, this communicates to our spouse that their viewpoints and ideas matter to us. We may not always agree with our spouse but just as we want to feel our own opinions and ideas matter, we need to do for them what we want them to do for us (Luke 6:31). Remember, love is not self-seeking (1 Corinthians 13:5). Love honors others (our spouses) above ourselves (Romans 12:10). Paul Miller writes in Chapter 11 of his book, “When we say ‘no’ to self and ‘yes’ to God, our love is pure.” He’s telling us God’s kind of love is not consumed with our own desires. He goes on to share how the secret to love is a hunger for conversation with God and a hunger for Words from God. For our love to be pure we need God’s help. For His help we turn to prayer and Scripture. The point I’m trying to make is the one I've mentioned in each post of this series. This love dare journey is all about Him. It’s about knowing Him better and what it means to follow Him. God is love. Without His help I will never learn how to love my husband with His kind of love. I need to say “yes” to God and “no” to self. Putting my husband’s needs before my own is about surrendering to God’s will. It’s about letting God shape my life. Who better to hand over control to? 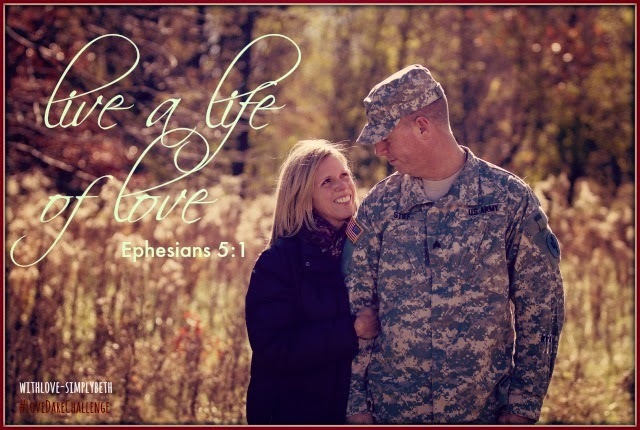 We were created to live a life of love (Ephesians 5:1). Without it, we are nothing (1 Corinthians 13:2b). I'm also convinced love is contagious! I received the sweetest Mother's Day message from my husband: “I wish I could come home if only for a minute and hold you in my arms and tell you just how special you are. Happy Mothers Day.” There were only a few tears when I woke to those words. Thank you once again for following along on this journey. I'm always grateful for when you share how you were encouraged in the comments. Oh, Linda that is so true and I may just need to use that in my next post. I don't want my husband and family to get the leftovers, that's for sure. I'm glad you are enjoying this series. Thank you so much for all your encouragement. Much love. Oh girl, this is just beautiful!!! Such truth that I need to be reminded of. I want to love my spouse and loved one better than anything. Thank you, June. I pretty much just stare at pictures of him all day. :) Much love to you. Thank you for coming along for the journey, Satin. I appreciate all your love and encouragement. You are a blessing to me. Love you so much. We were created to live a life of love. Beautiful. I love this photo of you and the Hero. Such love there on your faces for each other! Precious. Listening is surely one of the hardest things, but when we think of how we feel when someone really listens to us... wow... and often, that's all we need, is just to feel heard. So glad you did that for your Hero this week. Love you! I say that often, Shelly. How all we want is to feel seen and heard. It's so important to remember that in the way we treat others. Especially those closest to us. Thank you for your always encouraging comments. Love you. So glad you came by Being Woven for you reminded me of our earlier days in meeting through emails. You also gave me more food for thought about the butterfly being such a perfect creature for God to create to help us understand with more clarity our new life, the new man, the new creation. It is such a beautiful example. Congratulations to you being on the "Circle of Faith" online magazine cover. You are getting out there and really doing a wonderful job, Beth, of sharing God's love and truth. I had not see the online magazine for Circles of Faith so thank you for mentioning. I love those ladies!! Thank you for your kind words, Linda. I'm so blessed to know you in this beautiful blogging world. Have a blessed Sunday. Much love. Beth, you are doing such a good job...with this series, with supporting your man, with busying yourself while he is gone, with obedience. I'm so proud of you! Grateful that you are using this time to learn and grow and put those things into action. Hope you have a wonderful weekend. Much love to you! Thank you, Holly. I so believe God has me right where He wants me with this series. It's truly having an impact on this heart of mine and I hope that is reflected in my writing. Thank you for your encouragement. I hope your weekend has been wonderful. Much love to you, friend. I'm loving your Love Dare series! So encouraging! I admire you. Blessings to you and your loved ones! Thank you for all your kind comments, Kaylene. I'm glad you are enjoying the series. Blessed by your words and honesty! I always tell everyone I am a good listener but in reality I am quick to speak and slow to listen - fully listen with both ears! Thank you for the reminder today! Happy weekend! I'm glad you were blessed from this. Doing this love dare is teaching me much about what God's kind of love is and what it is not. Thank you for stopping by. Blessings. 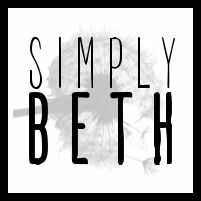 I love this Beth! I have recently been asking questions more intentionally! I have a friend who is super quiet - but her well runs deep and I have learned that if I ask enough questions and just wait... she opens up and we connect on a deeper level! My Honey and I were watching the Barbara Walters special last night and they talked about how great her questions always are... one set that she asks almost every time is what has been the best time in your life and what has been the worst? That had us pondering for quite awhile and opened up such great conversation! Stopping by from Barbie's today over at The Weekend Brew! So glad I did! I always love seeing you here, Karrilee. I really appreciated what you shared. I think it's important to realize that for some sharing doesn't come naturally but taking the time to ask questions helps open up the door for them. Blessings to you. I hope your weekend was wonderful. Jolene, I've picked up the book a few times in the past but never made it through. I think that is why I choose to write my way through it. It's forcing me to stay committed and the further I get through it the more I see God using it. It truly is a beautiful book. Thank you for stopping by and for sharing. Much love. Thank you, I learned an important lesson while I was reading your blog. I'm glad. Thank you for stopping by. Blessings. Hi Beth! What a wonderful post. I love that "ready, shoot, aim" principle. And did you see that one quote about "quick to listen" over at Denise's blog? What are you ladies telling me?? LOL! I'm so glad you could share how heart warming it was for you to take the time to really listen to your husband. And hear his heart. Even though you were on the phone, I bet it was a really intimate moment. That book is really transforming you isn't it? Well, you're doing the work, but you know what I mean. I did see Denise's post. Loved her message. You make me smile!! And I do know what you mean. God is using that book in mighty ways. What I love most is it's really putting me in His Word more and more. Again, thanks for the smile and for the encouragement. Much love to you. Beautiful, encouraging, challenging. I need to take more time to listen, to ask questions. Thank you for sharing your Love Dare journey. Thank you so much for following along on this journey, Barbie. I so appreciate you. Love you so much. I'm guessing there more than a "few" tears. ;) Reading ~ no... SEEING your heart open up here is just beautiful. It isn't often we get to see God's work in progress in the lives of others. I love it! Oh, Heather, thank you so much for your kind words. It really does mean so much to me. I hope and pray that God is using this journey to encourage others. I'm so glad you are enjoying. Blessings to you, friend.